The LifeProducts™ COMMERCIAL R.O. 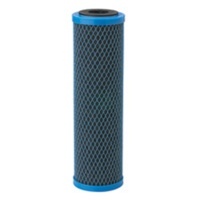 SYSTEM - 20" x 2.5" Carbon Block Filter provides comprehensive control of chlorine taste and odor. 0.6 μm nominal filtration with extended life as a fine sediment and silt control filter, comprehensive removal of chlorine taste and odor and chemicals that contribute to taste and odor, and high VOC reduction capacity.